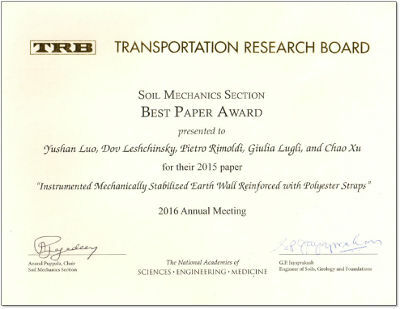 Maccaferri Inc. received an award for best sectorial paper. The paper discusses a Mechanically Stabilized Earth (MSE) wall with large concrete panel facing, reinforced with polyester straps, which is an emerging technology in the US. In order to enable the design of this wall system using AASHTO’s methodology, its classification of extensibility needed to be established. In part of a newly constructed interchange on Interstate 95 at Christiana, Delaware, instrumentation was added to monitor any movement. It is one of several similar walls enabling an access to bridges comprising that interchange. Monitoring included tensile force distribution at selected straps and force at the connection of a few straps to the large concrete panels. The data was recorded from April 2012, the beginning of construction of the instrumented wall, until June 2014, about 20 months after the end of its construction. When classifying this reinforced wall system as “extensible”, the maximum load in the straps and connections are about 4 times smaller than predicted using AASHTO and the lengths of the reinforcing straps are adequate enabling it to mobilize the required loads. After the monitoring period, the data suggests that AASHTO’s design based on extensible reinforcement for this family of MSE walls is adequate. The instrumentation remains in the wall and is still collecting additional data. Shown in the picture is (to the left) Anand Puppala, the chairperson of the Soil Mechanics Section at TRB and Professor of civil engineering and coordinator of the geotechnical engineering program at The University of Texas (UTA), Dov Leshchinsky (center) who is Professor Emeritus at Delaware University. On his right is Giulia Lugli, The Maccaferri Inc. MSE Wall System Technical Specialist and Regional Technical Assistant (NY, NJ, KY, TN). Not present were Yushan Luo, Pietro Rimoldi and Chao Xu, also authors of the paper.